Located along one of the most historic portions of the Florida coast, St. Augustine Beach is the place to relax or keep busy with many cultural and natural attractions. Conveniently close to the beach, St. Augustine Beach vacation rentals are perfect for families looking for the ideal getaway by the water. Adults and kids benefit from the amenities of St. Augustine Beach rentals and the quiet time they can have as the day's adventures are planned. St. Augustine Beach is a great destination point or a stopover to and from Disney and other points of interest in Florida. There is much to do in the local area as the historic city of St. Augustine is just over the Bridge of Lions. Museums and shops line the preserved streets and sit among the historic Spanish architecture. Natural attractions include the St. Augustine Alligator Farm, Zoological Park, and Bird Sanctuary, just a short ride away from St. Augustine Beach condo rentals. You can spend the day discovering the area's history and natural surroundings and return to a cozy apartment-style accommodation that affords peace of mind and prime leisure time. This is a place to enjoy the outdoors. Take the family on an excursion to Anastasia State Park, where you can picnic with a meal put together in the kitchen of St. Augustine Beach vacation rentals. The freedom of staying at a rental and the open beaches and marshes will allow your mind and body to rest as you explore the bird sanctuary, walk the nature trails, or swim in the ocean on Anastasia Island. Enthusiasts of maritime history can visit the St. Augustine Lighthouse and Museum where a climb to the top reveals extraordinary views of the water and landscape from a unique perspective. A day at the beach is sometimes the best thing, but you can also enjoy other aspects of St. Augustine Beach, such as the local art and music, bike riding, boat rentals, and golf. When you don't feel like eating in at St. Augustine Beach condo rentals, you can check out some of the fine restaurants nearby. Fresh seafood abounds in this coastal community and a stay at St. Augustine Beach is not complete without trying the local delicacies. 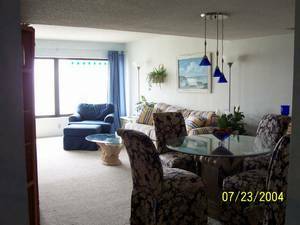 St. Augustine Beach rentals are the place to stay if you want accommodations that suit the family's needs and include options that surpass the quality of typical hotel and motel rooms. All things considered, the rental may be even more affordable than such rooms nearby. Jump start your St. Augustine Beach vacation planning by contacting a rental owner today. St. Augustine Beach vacation rentals are available with many options to consider that are much different than what hotels and motels offer, so you can have a truly unique and memorable vacation. Have a wonderful place to stay and embark on fun excursions each day, and the whole family will be talking about the great times they had at St. Augustine Beach. Interested in More St Augustine Beach, Florida ? Check out nearby Amelia Island , Daytona Beach , Daytona Beach Shores , Fernandina Beach , Flagler Beach , Ocala , Ormond Beach , Palm Coast , Ponte Vedra Beach , St Augustine .